What does Calcutta Kids do to build capacity within the community? It looks like the director is an American. For an NGO in India, how is this sustainable? Where does Calcutta Kids get its money? What percentage of my money will actually go to Calcutta Kids beneficiaries? Are donations to Calcutta Kids tax deductible? Why the name “Calcutta Kids”? Where does Calcutta Kids get its staff? How does Calcutta Kids deal with the issue of sustainable development? Does Calcutta Kids work with the government? Does Calcutta Kids always utilize evidence-based solutions? How does Calcutta Kids encourage saving to finance a facility-based delivery? Is there an issue with family size and population growth among the CK population? Why have a Diarrhea Treatment Center when you’ve already been so effective in reducing mortality? There are so many impoverished and undernourished children in the world; isn’t the work of Calcutta Kids just a drop in the bucket? Aside from financial contributions, how can I help? Can I use your data for my school project? What do all of the acronyms stand for? Have a question left unanswered? Ask us! Calcutta Kids is an Indian organization that empowers women to achieve positive health outcomes for themselves and their children. Read more on our work to achieve these objectives in our Maternal and Young Child Health Initiative section. The organization is deeply committed to capacity building within the very areas we are working. Accordingly, we have devoted considerable effort to training staff from these slum areas, who have become highly respected community leaders. We also do our best to work closely with local councils. Read more in our Community Outreach section. Having seen many foreign NGOs create dependency and then depart the scene, we are totally committed to the long-term sustainability of our efforts. Calcutta Kids Trust has an all-Indian board of directors, and looks to Indian as well as international donors for financial support. Where does Calcutta Kids get its funding? Generous contributions from friends of Calcutta Kids. Calcutta Kids is committed to keeping its administrative overhead to a maximum of 10% of its total budget. That means that at least 90% of the money you give to Calcutta Kids goes directly to medical services for Calcutta Kids beneficiaries and to keeping Community Health Workers in the field. Much of the administrative overhead goes to monitoring and evaluating the effects of our activities so that improvements can be made regularly. Yes. We will ensure you receive all of the necessary paperwork so that your donation will be fully tax deductible. India: under section 80G (5) (VI) of the Income Tax Act 1961. Calcutta Kids has a permanent FCRA account. Although the official name of the city was changed to Kolkata, that name is still unfamiliar to most people, particularly outside of India. The word “Kids” unfortunately does not capture the attention given to mothers. We try and make up for that in the program itself. Almost the entire staff comes from within 2 kilometers of the slum in which we work. A key aspect of Calcutta Kids’ commitment to sustainable development relates to education and model creation. We see a vicious cycle in families we serve: The young wife goes to live with her husband and his family. The husband’s mother often treats the young wife poorly – in part because she herself had been treated badly in the past by her own mother-in-law. By providing young mothers with love, support and information, we can help break that cycle. We can demonstrate to them the care that should be provided to a new mother. And then these women, in turn, can pass it forward to their own children and daughters-in-law. The most critical development of a child’s immune system and cognitive capacity occur during a child’s first two years of life. By keeping children well nourished and cared for during those critical years, Calcutta Kids is ensuring that these children develop fully functioning minds and bodies. Imagine the generation of today’s Calcutta Kids babies twenty years from now. Most will have grown well with strong minds and bodies, avoided serious illness, learned well in school and are well equipped as productive adults to face the challenges of the new India. Whenever we can. We strongly believe that governments are central to sustainable development. Accordingly, we work closely with local governments, boost their capacity and confidence whenever possible, and sometimes pass credit on to them for local accomplishments. 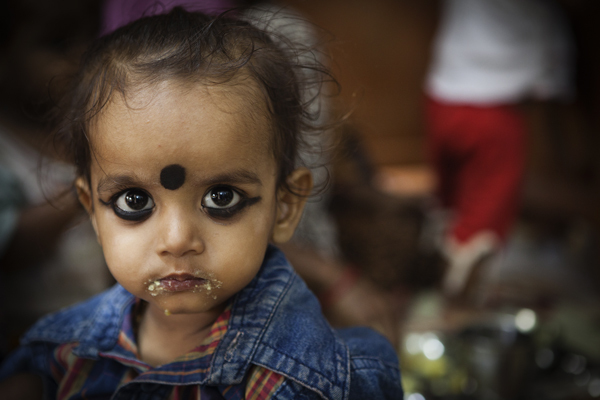 One important Calcutta Kids partnership is with the National Institute for Cholera and Enteric Disease (NICED). The Institute has provided Calcutta Kids with invaluable information for our Diarrhea Treatment Center and is participating with us in research designed to identify the pathogens associated with severe malnutrition and in turn the optimal treatment of these children. The government also, at times, has provided Calcutta Kids with immunization vaccines. At the same time, there are still many cases where local governments are not yet adequately involved in particular facets of the work we consider critical, or where they pursue these targets with inadequate attention to the most disadvantaged population groups. (One example, unfortunately, relates to child deliveries in government facilities.) In these cases, we sometimes work with non-governmental organizations, while continuing to remain in close contact with government counterparts on these issues. All of our programs are based on interventions that have been well tested and found to be effective and cost-effective. At the same time, Calcutta Kids has come up with many innovative means to deliver these services – means which we’ve found work well in the areas in which we work. One example is the package of pregnancy interventions – all based on international best practices. We have found that intensification of pregnancy counseling, and providing each woman with the sense that she is a unique individual and that the information she is receiving is specific to her situation, leads to more effective results. Another example relates to the Diarrhea Treatment Center (DTC). The protocol being used by the DTC has been provided by the renowned International Center for Diarrheal Disease Research. Calcutta Kids has added to these protocols an effort to empower mothers of treated children. The mothers subsequently become change agents relating to diarrhea prevention in their own neighborhoods. These savings, matched by Calcutta Kids, are then paid to the facility following the delivery. Calcutta Kids fully appreciates the importance of smaller family size and a reduced population growth rate. We’ve discovered something interesting in our work, which has been confirmed by a sizable body of evidence. Many poor families in developing countries are anxious to have two surviving sons. On average, this would require four children. But if there is concern that half the children may die before the age of five, having four surviving children may mean having eight pregnancies – ten to play it safe. By contrast, if a family receives the quality health care provided by Calcutta Kids, and understands that its existing children will survive, these additional pregnancies will no longer be necessary, and family size will decrease. Beyond the effect of health care provision described above, CHWs are regularly providing family planning information to the families with which we work, and referring families to reproductive health facilities. In some places, such centers are designed primarily to save the lives of children. In our area, where child mortality is now less of a problem, we are able to concentrate on the healthy growth and development of these children and reductions in the frequency and severity of illness. Read more in our Diarrhea Treatment Center section. Because we are a small organization, we are able to develop strong personal relationships with the people we serve and to develop mutual trust. We are also able to collect and analyze data carefully to ensure that we are providing optimal care to our beneficiaries in the most cost-effective manner. We can then share the results of our findings and information on the effectiveness of our programs, and, in so doing, contribute importantly to Indian and international efforts to reduce child and maternal mortality and malnutrition. If we look at the maternal and child health needs in the world, the impact of this project is invisible. If we look at the maternal and child health needs in India, the impact of this project is less than a dent. If we look at the maternal and child health needs in Howrah and Kolkata, the impact of this project is visible though still small. If, however, we look at the maternal and child health needs in these slums, the impact of this project is enormous. If, after reading this, you are still discouraged by the overwhelming need in the world, and the relative impact of a single organization, consider the following story. You may have heard it. A young boy was walking along the beach and came across thousands and thousands of starfish that had been washed ashore. The boy saw that the starfish were dying and began picking them up one by one and throwing them back into the water. A passerby saw what the young boy was doing and said, “There are too many starfish son, you won’t be able to save them; I’m afraid they are going to die.” The boy picked up another starfish, tossed it into the ocean and said, “Not this one.” Every one of these women and children is a human being and each one of them justifies what we are doing. There are several great ways to help! Please visit our Other ways to help section for more information. There are a lot of acronyms to remember when going through Calcutta Kids information. Click here for a list of commonly used acronyms. Ask us by emailing info@calcuttakids.org.